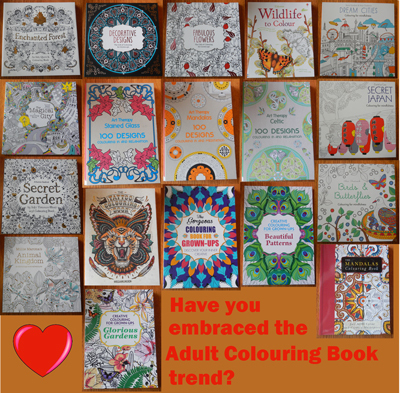 If you often frequent bookstores, you may have noticed an upward trend in the selling and marketing of adult colouring books. Once considered a child’s rainy day activity, adults (specifically women fifteen years and older) have begun sharpening the coloured pencils and purchasing books full of intricate and pretty designs and patterns. Marketed under the guise of promoting mindfulness, relaxation and meditation, many of these books feature flowers, animals, birds and cityscapes, and come in a variety of sizes, prices and styles. While Johanna Basford’s Secret Garden and Enchanted Forest may have sparked the trend, there are plenty more colouring books which are just as popular. (Note: Check out Basford’s website for pictures that her fans have sent in of their coloured-in (and sometimes embroidered) work. Their dedication to perfection is just inspiring!). Have you embraced this adult colouring book trend? How many do you have? Do you find the process of colouring in relaxing or frustrating? What kind of designs are you interested in? I really like this idea. I think it's a great way of focusing on something that is rewarding - akin to creating and completing a project. Unfortunately, my colouring skills are abysmal. Or perhaps it is the tools I use. In any case, I prefer to spend my 'me' time doing other things. I loved 'colouring-in' as a child! I pundit most relaxing, same with 'painting' books! Might check out this new craze!